If there’s one company that, by all accounts, should have been killed off by the smartphone revolution started by the iPhone way back in 2007, it’s BlackBerry. For years, the company was hampered by its insistence on sticking with its own operating system, and also by its legions of physical keyboard-needing fans. A lot has changed in recent years. BlackBerry switched to making Android phones then signed a deal with TCL (which owns Alcatel) to produce its phones. Its first Android phone, the Priv, was promising, the next two were rebadged Alcatel phones. None of them were true, modern replacements for the classic BlackBerrys of old. Then came the KeyOne: the first Android-powered BlackBerry with a physical keyboard sitting pride of place on the front, beneath the screen. Is this the Android phone BlackBerry loyalists and former fans have long wished for? Or just prolonging what many think is the inevitable? The easiest way to describe the KeyOne’s design is that it almost looks like an elongated Passport Silver Edition. It has a similar, industrial design on the top bezel, with the aluminium broken up by the pill-shaped ambient light sensor, squircle front camera cut-out and the machined holes covering the earpiece. By today’s standards, the KeyOne is a thick device. At 9.4mm, it’s a full 2.3mm thicker than an iPhone 7, and 1.5mm thicker than the less-than-skinny LG G6. It’s also technically heavier than both of those phones. Despite this, it doesn’t feel like a hefty phone. It’s well balanced, and has very rounded edges on the sides and on the bottom to make it ergonomic. Interestingly, the top edge is completely flat, which adds to the charm of the device. It’s different, which we think is a good thing. The only port here is the 3.5mm jack, which means the bottom edge has a more symmetrical design, featuring a central USB Type-C port, flanked by two trios of pill-shaped cut-outs covering the microphone and single loudspeaker. Where you can tell this phone has the Alcatel/TCL influence is in the organisation of the buttons. Like the brand’s other phones, the power/sleep button lives two-thirds of the way up the left edge and can be tricky to reach. If, for instance, you’re done typing, you’ll need to adjust your grip purposefully to reach it with your index finger, which is annoying. The volume rocker and programmable Convenience Key live on the right edge, both of which are easy to get at with your right thumb. If you’re left-handed, they’re placed low enough down the edge to be within easy reach of your index and middle fingers. It’s rare these days to get a phone that fits so comfortably in the palm. Thanks to those aforementioned curved edges, combined with the textured plastic on the back, the KeyOne feels warm and comfy. As you’d expect from a phone with a full keyboard on the front, it feels better in two hands than in one. How natural it feels in use depends on what you’re most accustomed. Chances are, if you’re a regular BlackBerry user who is used to having to reach over a keyboard to interact with the touchscreen, the KeyOne won’t be a massive adjustment. If you’ve become used to fully touchscreen phones, it might take some time, and a change of grip to work with the touchscreen. The KeyOne may only be 4.5-inches, but the bottom edge of the display is about one inch higher than you’d normally find it on most other smartphone screens – which means the very top edge and corners are about as far to reach as they would be on an all-touch 5.5-inch display equivalent. There’s no pretending, it’s the physical keyboard that’s of most importance in the KeyOne. It’s the one feature that will draw the nostalgic former BlackBerry addicts back to the brand and the one thing that’ll persuade the Classic and Q10 owners to finally upgrade. As with many BlackBerry keyboards over the past few years, all four rows of keys are separated by attractive, polished metal frets. They not only help to create a visual distinction between rows and add a premium finish, they also add more space, helping you feel the space and – hopefully – help you to hit the right button. 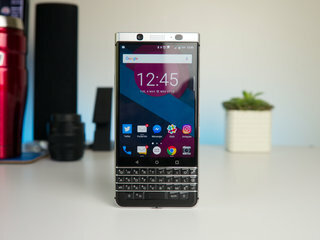 In classic BlackBerry fashion, the keys are all sculpted, but nowhere near to the same levels as the famed keys on the old BlackBerry Bold range or the Classic. Indeed, they’re more similar in shape to the Passport. The sculpting is fairly subtle but, again, enough to help you distinguish between the keys as you glide your thumbs over them. That’s not just a figurative phrase either, you can literally glide your thumbs over them, making use of the touch-sensitive surface. This can be used to scroll up and down lists, sideways through images and home screens, and to select the predicted words that appear on the bottom of the screen as you type. While the phone does have a Convenience Key on the right edge, the truth is that each of the keys on the keyboard can essentially be used as a Convenience Key. You can assign shortcut actions to every single letter. In fact, you can assign two: one that launches when you just press it, and another for when you long-press. As an example, you can have you alarms show up when you press A or start a new timer when you press T. It’s entirely up to you. You can have each key launch an app, or have it launch a specific function. Once you’ve set them up, it’s a huge time saver. We love its usefulness. Adding to the keyboard’s versatility and usefulness, the space bar on the bottom row also acts as a fingerprint scanner for unlocking the phone. In our testing, it’s been just as quick and reliable as some of the best scanners we’ve reviewed. It might not be as lightning fast as the likes of Huawei, but it’s quick enough, and hasn’t failed to recognise our thumbs so far. The typing experience is pleasant enough too, and your own experience of it will depend entirely on which BlackBerry you last used. Compared to something like the original Bold, or – even further back – the 7230 (yep, nearly 15 years back), the keys don’t give as much of a hard click. It’s a softer, but still a pleasingly tactile response. While we would have preferred the more old-style pronounced ridges on the keys, they would disrupt the modern look of the KeyOne. There’s very little about the KeyOne that’s conventional, including the screen. It hosts Full HD levels of sharpness, but with a portion sliced off the bottom to make room for those keys (hence the stunted 1620 pixels of vertical resolution, rather than 1920). That means, rather than a 16:9 ratio display that’s ideal for watching videos in landscape, you get a 3:2 ratio screen. That’s a ratio we’ve not really seen since Apple’s iPhone 4S. What that means is that you get letter-boxing, or black bars, across the screen when you’re watching regular widescreen content. If you’re unfortunate enough to try and watch some of Netflix original series’ – which are beamed in roughly 18:9 – the letterboxing gets worse. It’s fair to say, then, this isn’t a screen designed primarily for video consumption. Despite that, the ratio does make it ideal for some things. With the width being two thirds of the length, there’s more room on screen for text when you’re reading books, emails and web pages. It also happens to be ideal for more traditional ratio photographs. The IPS LCD panel is certainly sharp enough to make any media enjoyable. Even when looking closely, it’s virtually impossible to distinguish individual pixels on the display. Round object edges are smooth, as is fine text. While contrast isn’t as impressive as it might be from an AMOLED panel, it’s still decent. What’s more, colours are natural and look good. With a user interface and stock apps mostly using white backgrounds, the decision to opt for an LCD screen makes sense for a neutral balance. As with all of its previous Android phones, one of the major benefits of choosing a BlackBerry is the additional software. While most manufacturers add redundant apps and questionable user interfaces, BlackBerry Mobile adds mostly useful extras. Some considerable enough to make BlackBerry the only obvious choice for some business types. That means you get the BlackBerry Hub, which brings in all the notifications from across your apps into one useful feed. There’s the email app, too, which we think manages email better than most other email apps. Conversations are collapsed neatly, without endless pages of replies, and individual messages and images are better scaled to fit the screen. There’s also the Notable app which lets you create notes and markup images or screenshots, while the calendar app is clean and distraction-free. Like previous Android BlackBerry phones, the DTEK app gives you an overview of your system’s level of security and advises of actions needed to take to make it even more secure. On a similar note, the Power Centre app gives you an overview of settings you can change to better conserve battery. In the Android software there’s also an updated version of the Productivity tab that gets you easy access to calendar, reminders, unread messages and recent contacts. This lives on the right of the screen by default, but you can switch it to the left side, and launch it by swiping the small white tab on the edge of the screen towards the centre. Device Search lets you search for virtually anything on your phone, whether it be an app, a contact, or anything else that could be in an email, calendar event or somewhere remotely online. You can also launch any widgets by swiping up from an icon on a home screen that has three white dots beneath it. Under the hood you’ll find Qualcomm’s impressive mid-range Snapdragon 625 processor. Sure, it’s not top-of-line compared to other flagships, but even so you’ll find that virtually all of your transitions are quick and smooth. There’s no waiting around for anything to load, although we did find that sometimes the wireless network (Wi-Fi and Bluetooth) was a little slower than we’d like. Taking a few seconds to refresh data in a web-dependent app was a tad frustrating at times. For the most part, the KeyOne is a relatively lag- and stutter-free experience. We say relatively, because we noticed when gaming that as background data/processes were happening that animations on screen did sometimes stutter a little. It wasn’t too noticeable, but it was there, and something you won’t experience much of in more powerful devices. Perhaps an increase from 3GB RAM to 4GB would have been beneficial here. Our average use – according to the KeyOne’s Settings menu – was 2.5GB out of total available 2.8GB, so more memory would make sense. Still, we think the KeyOne’s performance is impressive. This isn’t a device built for gaming or multimedia, rather for getting things done and communicating. It’s a noticeably smoother and more reliable experience than we had with either the DTEK50 or the Priv from the tail-end of 2015. From a storage perspective, the KeyOne comes equipped with 32GB of internal storage to use for media and apps. It’s the bare minimum you would expect, but it can be expanded. You can adopt a microSD card (up to 2TB) and use it as internal storage if you need, although you need a fast one to ensure that performance isn’t negatively impacted. The battery life on the BlackBerry KeyOne is one of the best we’ve used so far this year. No exaggeration. Thanks to making full use of Android Nougat’s enhanced Doze mode, standby time uses very little of the battery’s juice. What’s more, having a smaller screen with fewer pixels than a traditional 1080p display helps. In our experience, the 3,505mAh battery was capable of getting us to the end of a second day with moderate use. With heavy use, you’ll easily get from morning until bedtime with some battery to spare. For a device seeking to draw in the ultra-productive types, this is a big selling point. It means you can go from sunrise to sunset, crunching emails, taking conference calls, and taking the odd sly break to beat your Temple Run 2 score, and not have to plug in to top up. Even if you are hard enough on the phone and drain its battery before the day is up, then the Quick Charge 3.0 power adapter can give you 50 per cent charge in just 36 minutes (not at the upper end of the charge, however, which will take longer). It’s no secret that BlackBerry has never really focused on its camera offering. Funnily enough, given our enjoyment of all the benefits of using a BlackBerry again, we almost forgot the KeyOne had one. But, surprisingly – and we think that’s a fair term – the KeyOne’s snapper isn’t bad at all. It’s features a 12-megapixel sensor with large pixels and 4K video recording capabilities. It’s also equipped with phase detection autofocus (PDAF) and a feature called fast focus lock, which means you can focus on whatever you’re shooting quickly. It succeeded in focusing in good light far more often than it failed, even when objects were close-up to the lens. In daylight, the camera is capable of producing well-exposed shots with good colour and sharpness. In lower-light situations, results were mixed: sometimes they would come out a tiny bit blurry if we didn’t keep our hands perfectly still, and there was often image noise visible as a result of the sensor being worked hard. The disappointing part is that – unlike so many other current Android phones – the manual mode is hidden away in the camera settings menu. But once activated, you can adjust focus, shutter speed, ISO, exposure compensation and white balance. The front camera is a similar story. While low-light selfies can get grainy, the use of the screen as a front-facing flash means that your face will be adequately lit. Often we found that selfies came out looking soft, however, despite looking very sharp on screen before pressing the shutter. If there was ever a device to convince BlackBerry loyalists to jump onboard Android, the KeyOne is it. It’s a more complete package than the Priv was, and is a much more compelling device than either of the two most recent all-touch phones. It might even be the device to convince older BB fans to leave their newer iPhone or Galaxy device behind. At £499 the KeyOne isn’t cheap considering its specification, but it’s not flagship expensive either. Besides, there’s literally nothing else like it on the market – it’s a truly standout device, for many of the right reasons. Its camera and screen are good enough to please anyone, while the battery is up there with the best we’ve seen. Whatever you think of BlackBerry, we think it’s great to have something different in the world of Android. A phone with added software that enhances rather than tarnishes the experience. A physical keyboard included, without any major hardware compromises. It won’t be for everyone, granted, but for the ones the KeyOne is made for, it’s quite simply masterful. For those wanting a more traditional Android flagship, the Galaxy S8 is a great option. With Samsung Knox, you get the reassurance of great security protocols, and for those wanting some physical keys to type on, there’s the optional Keyboard Cover (which is nowhere near as good as the keyboard on the KeyOne, but it might help soothe your QWERTY withdrawals). Apple’s iPhone has long been one of the most trusted devices by big business for its security. It’s big, elegant, powerful and a productivity powerhouse for those who don’t want a physical keyboard. What’s more, it has a great camera, a great selection of apps for all purposes and a battery that will last a full day without trying.